The opera Lost Childhood—based on the autobiography The Lost Childhood by Yehuda Nir—depicts such an encounter, interspersed with scenes from the life of the teenage survivor and his family. 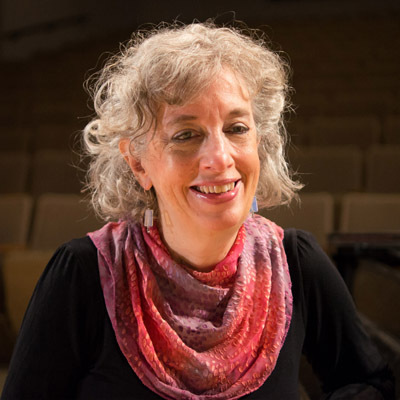 With a musical score by Janice Hamer, a visiting associate professor at the College since 2003, and a libretto by Mary Azrael, Hamer’s cousin, Lost Childhood premiered Nov. 9 in the stunningly beautiful concert hall of Strathmore Music Center in North Bethesda, Md. The date was carefully chosen to coincide with the 75th anniversary of the Reichskristallnacht—the night when Nazi thugs rampaged through the streets slinging bricks through the storefront windows of Jewish businesses and carpeting the roadways with broken glass, signaling the beginning of the Holocaust. The one-time performance, with the National Philharmonic Orchestra, was conducted by Polish conductor Piotr Gajewski, son of a Warsaw ghetto survivor. The story, sung by the National Philharmonic Chorale and 12 professional soloists, depicts a fictional meeting in a New York bar between now–grown-up Holocaust survivor Judah Gruenfeld and Manfred Geyer, a German psychiatrist and son of Nazi parents, who lives in New York City. Their conversation is based on Nir’s book and a real meeting between Nir and Gottfried Wagner, the great-grandson of passionately anti-Semitic composer Richard Wagner. Nir and Wagner—a vehement and outspoken opponent of the anti-Semitic inclinations of his family—became good friends and now work together on reconciliation. 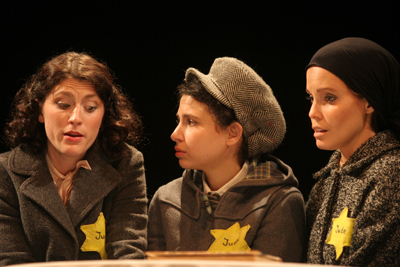 Judah and Manfred’s discussions are broken up by a series of flashbacks, such as the child Judah posing as a Catholic to outwit the Nazis and his non-Jewish Polish neighbors, who would be rewarded for reporting him if they knew he was a Jew; a poignant love scene between Judah’s sister Lala and her boyfriend Ludwig who forges identification papers for the family; or a scene in a German labor camp where Judah manages to sneak away from the mandatory shower that would reveal his circumcision and hence his Jewish identity. A scene from Janice Hamer's opera, Lost Childhood. The conversation, sometimes quite impassioned, of Judah and Manfred in the bar, traverses the themes of loss, grief, anger, guilt, and forgiveness as they work through their troubled pasts—one the survivor, the other the child of perpetrators. Their mutual and repeated claim “I am listening” gives reason to hope. The music, at times jarring, dissonant, disturbing, terrifying, then lyrical and romantic, reflects the storyline perfectly. Some members of the audience were moved to tears. When the opera ended, the concert hall exploded as audience members delivered a standing ovation. The music department provided tickets and transportation for 12 of Hamer’s students to go to the performance together. Several others made their own way there. Some of them, who had attended Hamer’s musicianship course and a couple of alumni worked hard alongside the popular professor, proofreading the score and helping to design the sound effects. “It’s a regular cottage industry,” says Hamer. Piano teacher Ben Kapilow ’13, a music major at the College who was frequent participant in Hamer’s musicianship courses as well as one of her independent study mentees, attributes much of his musical development to Hamer. “I’d heard about the opera as a freshman, so I was happy when Jan asked me to proofread the parts. I really got a taste of her musical tendencies and language, which allowed me to critically examine and question my own musical voice, since I’m a composer as well,” he says. Dan Perelstein ’09, an engineering and music honors double major and award-winning sound designer in Philadelphia, who is the grandson of Holocaust survivors, contributed a number of sound effects to the opera’s first act.